There had been signs of weakness in the economy well before 1929. A good part of the productive system depended upon a high rate of consumption, yet as we have pointed out, much of the population suffered from low incomes. Furthermore, the speculative boom inflated values and credits and linked prosperity to future expectations rather than to current realities. The ability to keep business going rested on the faith that prices would continue to rise. Hoover's attempts to deal with the depression can be broken down into three phases . First phase--Hoover felt the economy was sound and just needed confidence. Thus, government should not interfere with business. He took steps to prevent the spread of the depression. In a series of conferences he tried to persuade business leaders to keep wages and prices up voluntarily. Business did, but when consumption and trade fell off, they laid people off. Second phase--As the depression got worse, Hoover was determined to keep government small and relief at the local level. Third phase--Hoover endorsed a compromise relief program with the establishment of the Reconstruction Finance Corporation (RFC.) The RFC lent money or gave relief loans, and started public works programs. However , it put only $1.2 billion into circulation in six months. As the depression deepened , the view grew among voters that Hoover was a do-nothing President. Yet the impression of Hoover as a do-nothing President is a false one. Hoover's administration did more in its attempt to bring about recovery than any previous administration, either Republican or Democratic, in earlier economic depressions. Franklin Roosevelt continued some of Hoover's policies, including the RFC. The problem was that neither Hoover nor anyone else did enough fast enough to reverse the downward spiral from 1929 to 1933. In many areas, Hoover was following what was thought to be the best policies . The problem was just too complex . Hoover's economic philosophy , as well as that of most of his fellow Republican's and huge sections of the Democratic party, greatly inhibited his attack on the depression. His most important inhibition was his conception of the role of the federal government in the economy. Hoover believed that the sole function of government was to bring about a condition of affairs favorable to the beneficial development of a private enterprise. He held tight, however, to the view that for the federal government to reform or reorganize the economy, even when the economy obviously did not function well, would inevitably mean a loss of individual freedom. Thus, all Hoover could do was work within his fundamental framework and hope for economic improvement, which failed to materialize. Hoover firmly believed that direct aid to poverty-stricken people was not a legitimate function of the federal: government:' All aid to the needy, he maintained, was the responsibility of state and local governments and of private charity. 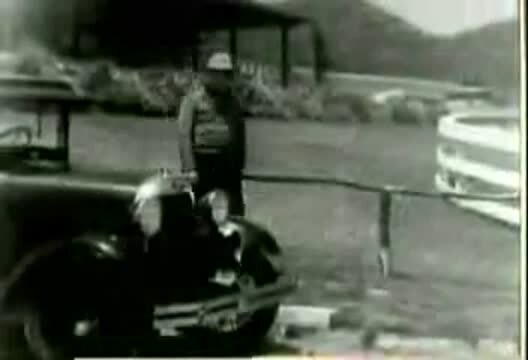 As far as the federal government's activities were concerned, he placed a higher value on the security of private property than on the welfare of human beings. Individual welfare improved only indirectly under Hoover's policies. 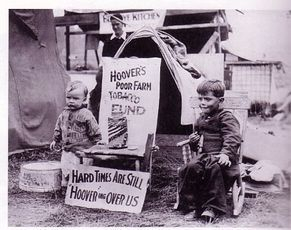 Hoover believed in the "trickle down" theory of federal aid. For example, the Hoover administration lent huge amounts to banks and railroads on whose condition the welfare of thousands of individuals was partially dependent. Franklin Roosevelt came UR with direct aid at low levels to spur consumption to pull industry, out of its slump. All humanitarian consideration aside, economically, the "trickle down" method of federal aid was not as effective in combating depression as direct aid to low-income groups (Keynesian Economics) would have been . The poor, after all, would have spent their aid very quickly, thereby lubricating the economy. Hoovervilles can be defined as “shanty towns built by unemployed and destitute people during the Depression of the early 1930s” (OED). These United States insolvent living areas popped up in numerous places over the nation, as most Americans were unable to pay their mortgage or were evicted from their land by the banks. The following video will help you further understand the horrific living conditions experienced by many.